Rotating Display Easily Shows Off What is Placed for Sale. Durable Metal Construction is Meant to Last in Retail Settings. 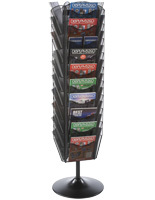 80 Deep Pockets Great for Magazines, Catalogs, & Cardstock. 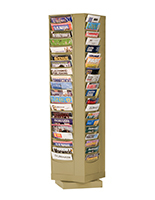 The upright steel literature stand is a freestanding magazine rack that is ideally placed in retail newsstands, waiting rooms, and school lobbies. 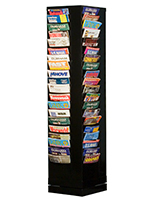 The rotating leaflet holder has 20 pockets on each of its four sides for a grand total of 80 slots to display forms or periodicals. 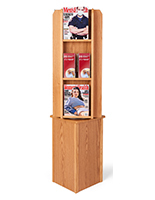 The literature stand with putty colored base and display is able to be placed in many different locations because of its simple design and neutral coloring. 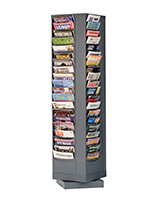 The freestanding leaflet holder rotates to offer customers an easy way to see everything that is available for purchase. 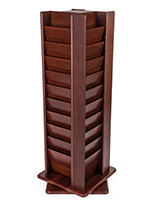 The stand has long and angled pocket so that items placed in them won’t bow over and become damaged in addition to hard to see. 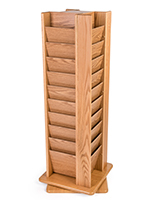 The magazine rack is easy to assemble quickly and doesn’t require the use of tools to put it together.